Aiden (to the Head of School): Excuse me, what floor's my classroom on again? Aiden (to me): It's okay mommy, you don't have to walk me up. I got this. And off he went. Up the stairs. Into his classroom. And ready to take on first grade. Just like a total boss! Ever since he began this new chapter and milestone in his life, Aiden's quickly learning what I've been meaning when I've been saying that all he has to do is try. That showing effort counts for a whole lot in this world. That persistance and perseverance will take him places that being cute and charming and a ball of energy will not. He's learning the true power of having grit. Especially when it comes to fluently reading "harder books," as he puts it. Our conversation about hard work and perseverance is pretty much a daily occurrence these days, and, in my attempt to not let our talks turn in to a Mommy Lecture, I'm trying to find other ways to introduce the conversation. Through books. And children events. And movies. Like Akeelah and The Bee on Netflix.com. 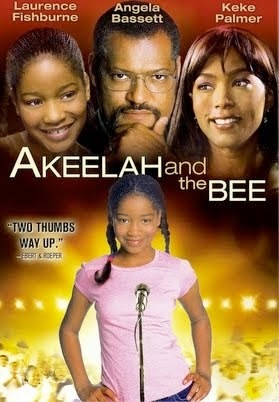 This movie is about eleven-year-old Akeelah Anderson, who is determined to spell her way out of South Los Angeles and make it to the National Spelling Bee in Washington, D.C. This is a movie of persistence, talent, and the power of hard work. It makes for a great discussion about endurance and finishing strong. And that's exactly what I hope to instill in Aiden. I have Akeela and the Bee in my video library...great lessons you're teaching Aiden. I still haven't seen that movie. I can see how it would serve as an awesome teaching tool though.